We here at Deadspin prefer it when athletes commit their assaults on the playing field. It means we get to see it all on video. Offerman, who doesn't get the MLB tag because he's been out of the big leagues since 2005, has nonetheless managed to stay on our radar due to his anger management issues. You'll recall when he charged the mound, bat in hand, and got a police record for his trouble. According to Wikipedia, the court found he was "not likely to offend again in the future." Whoops. 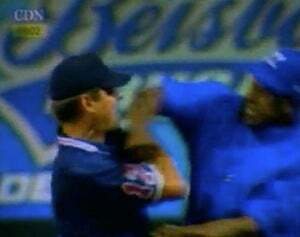 Offerman is the manager of Dominican winter league team the Licey Tigers, and was protecting his catcher, who had just been ejected for arguing balls and strikes. He did this by yelling at, swearing at, and hitting the first-base umpire instead of the one who tossed his catcher. Though the punch probably wouldn't have injured a hypothetical fly resting on the umpire's chin, that's still a big no-no. Offerman was taken directly to the police station, to see if umpire Daniel Rayburn would press charges. It's still not known if he'll be charged, but Offerman appears to be salting the earth in every baseball league on the planet, making sure his career shall never grow again.